Hong Kong skyscrapers are an icon of the city. There is nowhere in the world that has more skyscrapers--not even ​New York or Dubai. There are several different ways of counting a skyscraper but whichever way you roll out the measuring tape Hong Kong always ends up on top. Hong Kong has around 300 buildings over 150m (versus around 225 for NYC) and roughly 60 buildings over 200m (versus 55 for New York). From this forest of concrete, we’ve tried to pick five of Hong Kong’s most important skyscrapers, not only the tallest but the most famous and those with a unique design. Ironically – with just 44 floors – this is the smallest skyscraper on our list but Hong Kong’s HSBC building is arguably the city’s most beloved building. Built in 1986 by celebrity architect Norman Foster, the price tag of HK$5 billion made it the most expensive construction in the world at the time. Its characteristic design utilizes a glass façade and features both mirrors to reflect natural light inside and also a hollow, two-story atrium in the center of the building that lets you see into its heart. Due to the urgency of the project and the restriction on overnight construction in Hong Kong, the building was constructed on a modular basis with pods built elsewhere and shipped to Hong Kong. As a result, the building has a space age, interlocking appearance. The site of the building has housed HSBC local and later international headquarters since 1865 and on the ground floor, you can still see Stephen and Stitt the HSBC lions. Kidnapped by the Japanese during the war only to be found on a scrapheap in Osaka, it’s considered good luck to rub the lions' paws. Hong Kong’s very own Transformer — the pair of skyscrapers that make up the Lippo Centre look like Optimus Prime halfway through a transformation. It’s more popular local name is the Koala Tree because it resembles koalas scampering up a tree. This would be an incomplete list without the city’s current skyscraping champion — International Commerce Centre stands 118 floors high and is the tallest building in Hong Kong and the fourth tallest in the world. It’s also home to the world’s highest hotel — the Ritz Carlton — the world’s highest bar and a bunch of other facilities that can lay claim to world records. A testament to the growing influence of Kowloon, the building sits on the peninsula’s shoreline in the burgeoning commercial district of West Kowloon. The architecture is relatively bland; a square shaped building wrapped in glass, but this is one of Hong Kong’s most tourist-friendly skyscrapers. 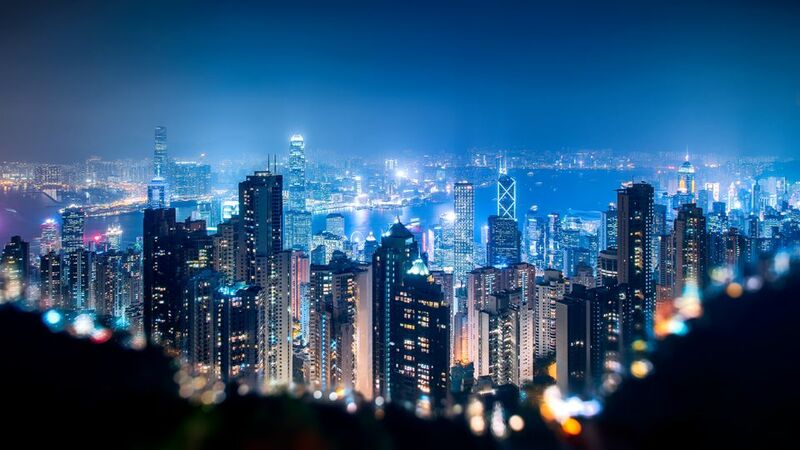 The Sky 100 Observation Deck is a dedicated viewing platform that affords premium views over the Hong Kong skyline. One that definitively splits opinion, the Bank of China is one of the Hong Kong skylines’ most dominating skyscrapers. 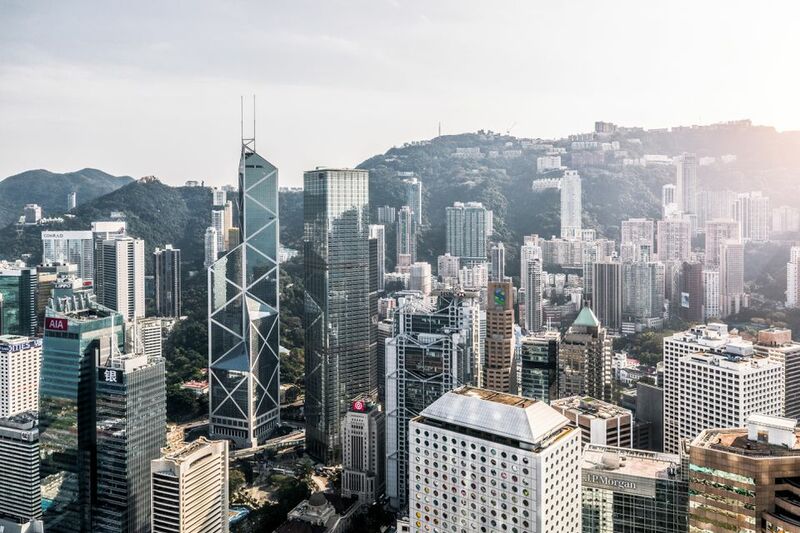 Designed by landmark Chinese architect I.M Pei, the building stands on the outskirts of Central on the slopes of The Peak and boasts 72 floors. The Bank of China tower’s triangular design is full of gleaming sharp edges — and it’s these edges and corners that give rise to much of the building’s controversy. This is one of Hong Kong’s few buildings constructed without consulting a local Feng Shui expert — an unforgivable oversight for many locals. The sharp edges are said to transfer bad Feng Shui and with it bad luck — it’s perhaps no coincidence that they are pointed at competitor HSBC across the road. Since the bad press, the building has installed water features and plants to alleviate the bad feng shui. Unlike any of the other skyscrapers on our list that are relentlessly modern, Jardine House maintains a nod to the past and to its namesake — Jardine’s — maritime trading past – with round porthole windows. There is a definite nod to the city’s colonial origin in the architecture while the ‘Moon widows’ — as they are known locally — also offer powerful Feng Shui. Built in the early seventies and 52 floors tall, this was one of the city’s first skyscrapers and while it’s been surpassed by its neighbors in recent years, it remains a distinctive landmark.